Love and freedom intertwine in human life, forming a core duality in harmony with the ancient concept of yin and yang . Because love and freedom are connected parts of a whole, each requires the other. A lack of love harms freedom; a lack of freedom harms love. Individuals and societies need high levels of both love and freedom for optimal health. Individually, we require love because we are all brothers and sisters, and love is what we were born for. Yet we also require freedom because each of us is a separate and unique individual. We each have our own desires, abilities, interests, and preferences. This natural diversity among individuals makes us more than drones; it makes life interesting, for one thing. Individual differences make human society as we know it possible and bring surprising strength and adaptability to the group. Love, for its part, is the necessary lubricant and anti-corrosive for a free society. Neither laws, nor religious teachings, nor anything else can replace the need for widespread love. Our dual nature means that love includes both a sense of oneness with others and respect for each person as a unique, free, and self-controlling individual. 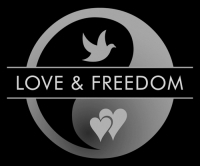 "Love requires freedom" is no overstatement. Without freedom, love withers and dies. To take away another's freedom is to treat that person with un-love. Extreme examples include kidnapping, slavery, and police states, but all forms of coercion damage love. Even seemingly minor reductions in freedom begin the process of corrupting love, because love and coercion are polar opposites. More of one always means less of the other (aside from natural exceptions mostly having to do with protection of infants and young children; pulling a toddler back from a busy street, for example). Coercive government – the State as we have known it – has historically been by far the greatest enemy of freedom, and thus the greatest destroyer of love. This remains true today, as any newspaper will amply confirm: war; torture; death camps; unjust laws and imprisonment including vast gulags ; needless poverty and even famine  – all of these are the results of government action, and the extremely widespread emotional damage caused by such horrors perpetuates the worst elements of the human condition. Freedom requires love, no less than love requires freedom. Without sufficient love, a society falls apart. Healthy social interaction, honest market activity , the division of labor , and other cooperation ultimately needed for humans to survive and prosper all require the widespread sense of connection that only comes with love. Love for others is a natural part of emotional health, which develops in the earliest weeks, months, and years of life – if we get the love we need during that time. This sensitivity to early conditions makes the treatment of pregnant mothers, newborns, infants, and children absolutely critical. Emotional damage in the young – caused by neglect, emotional cruelty, violence, coercion, sexual abuse, and other distress – lasts a lifetime . Neurosis has been passed down from generation to generation for thousands of years, and bringing a halt to this ongoing disaster is of critical importance in the 21st Century. Not only are individual lives ruined by a lack of love and freedom, in extreme cases (which are not all that rare) widespread emotional damage combines with government coercion to create the epic horror of a Germany under Hitler , a Cambodia under Pol Pot , or a Zimbabwe under Robert Mugabe . Fortunately, it is possible to reduce the emotional damage we inflict on the young. Small, simple actions right at the start (a gentle birth, for example) can have enormous and life-long positive impact. Treating children with respect and compassion is not difficult and makes the children happier and thus more pleasant to be with . Reducing government coercion (war, drug laws, eminent domain, the militarization of police , the purchase or other control of government power by corporations and special interests, etc.) would have very widespread benefits. Simply reminding others of the connected nature of love and freedom will encourage positive action; so will spreading understanding that the character of our world is created largely by our treatment of the young. The rules for balancing love and freedom in life – for example, in protecting a child or infant from harm – are engraved deep within us, far below the level of intellect. Trying to replace these ancient, natural guidelines with high-level, upper-brain logic typically leads to problems and often to tragedy. That topic – the nature and importance of different levels of consciousness – is the subject of next week's column: Feeling, Emotion, Intellect: Why Rational Thought Is Not Enough.